Our truth is built on transparency. Because having complete information allows clients to make better decisions. It saves time. It’s better for business, better for people, and ultimately better for the long-term relationships we cultivate. Our truth leads to extraordinary results. Information is power and we give it to our clients, because that’s what they deserve. We’re playing a long game, practicing honesty and mutual respect to help our clients thrive. Our truth is that both Sheer and our clients can win. We don’t believe in zero-sum strategies; we protect our clients’ business interests like our own. Because if they don’t win, we don’t either. And we don’t like losing. This is our truth. What makes transportation management different at Sheer? We’re more proactive. Using real-time data and business intelligence, we’ll analyze and boost virtually every aspect of your logistics network before challenges come up. A truly end-to-end supply chain solution. Measure anything and everything. Transportation costs. Internal efficiencies. Supplier performance. Industry trends. Our SheerExchange platform can provide a wealth of knowledge – and a wealth of opportunities. 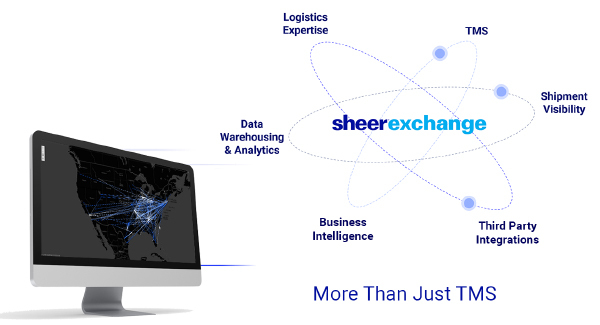 SheerExchange captures data throughout the order lifecycle, pulling from our Transportation Management System, your Enterprise Resource Planning System, and data from carriers, vendors, warehouses, and customs agencies. SheerExchange consolidates data into a clear, visual representation of your end-to-end supply chain operations; providing real-time reporting so the right people can make informed decisions. We make sense of all of it on a single dashboard that provides a clear, comprehensive view of your logistics operations. Run custom analytics reports, act on insights, and build new capabilities for your business. That means zero conflict of interest. We’ll be your advocate in competitive bidding, ensuring you get reliable carrier capacity at the right price. We’ll assess your current technology and process flows so we can recommend improvements that save time and money.